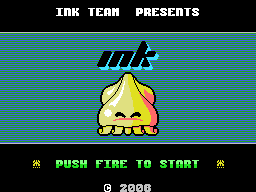 The fairly new INK Team presents a new game with yet a classic concept: INK. You are in control of the little kraken Kuro. Spill the oceans with ink throughout all levels. Beware for Claws the crab, he will try to snap you between his pincers. 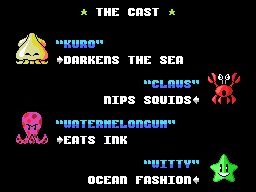 Next foe is Watermelongum: he'll eat up your ink! Be sure to follow closely! Witty the starfish will block your path, as well that of your foes. Always keep this in mind while planning your road through the vast seas and oceans! Use the cursor keys to move Kuro around, while avoiding Claws. The inevitable cornering might occur: your failsafe is the [SPACE] key. All Claws will freeze for some time, so you can proceed carefully and get to a safe place again! Note that you can use this feature only three times per level: planning is advised! Be sure to properly connect your data recorder onto your MSX computer. Note that your MSX computer needs to have a tape connector, which is absent on several MSXes, like the Panasonic FS-A1GT, the FS-A1ST and the FS-A1WSX. Once you have connected your hardware properly, put the tape into the data recorder, with the text 'Side 0' facing up. Adjust the volume of your data recorder properly, to about 50% to 75% of the maximum volume. Boot your MSX while holding [CTRL] and [SHIFT] key down to free up more memory. 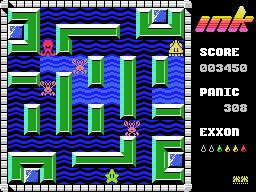 Once you've arrived in MSX-BASIC, type the following: RUN "CAS:" and press [RETURN]. Press the [PLAY] button of your cassette recorder and off you go! When the above doesn't work, try to experiment with the volume slider. Always ensure to rewind the tape before usage. This site is © [D-Tail] / Bitwise, 2004. Cascading Style Sheet is © [D-Tail] / Bitwise, 2004. MSX™ is a trademark of MSX Association. This site is viewed best with Mozilla Firefox at 640*480 or any higher resolution.